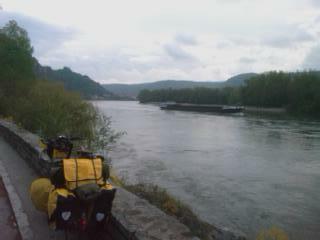 The Danube cont. 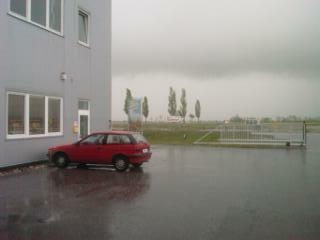 And rain. Lots of it. The less said about today's ride the better. Eighty-four hard, and for the second half spectacularly wet miles (see grey pic above), the last 30 slogging through a succession of thunderstorms in a vain search for a warm dry B&B. I've ended up having to put up the tent anyway, in Tulln on the Danube about 30 miles short of Vienna.Thank Heaven for waterproof Ortlieb panniers, so at least my sleeping clobber is dry. And, how come there are no free guest rooms in one of Austria's major tourist destinations in the middle of a rainy week in April and not even school holidays? And – moan, moan – that Achilles tendon is playing up so badly after all that for the first time I'm beginning to wonder if I'll have to cut this trip short. The prescribed cure for an inflamed tendon is rest. Several weeks of it. Hmmm. Before things turned seriously unpleasant today, though, the Danube turned for a while seriously picturesque and unboring. Offering an unusual opportunity also for self-reflection, as you can also see. 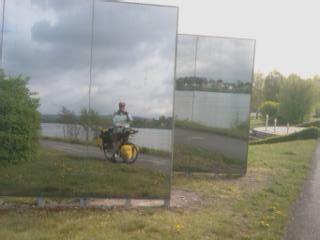 Always good in the therapeutic business – but I can't immediately see why the local folk at this point of the Austrian Danube put up a line of perfectly honed mirrors alongside the cycle path. Perhaps they make mirrors there? Elsewhere in today's pictures, Duernstein (with Raven) where Richard the Lionheart once had one of his major Central European crusader castle bases (top left on the hilly horizon) as he and his medievally merry men were heading out to bash the Muslims and claim Jerusalem. These days, I guess aircraft carriers do the same. Vienna, slowly and carefully, tomorrow. Old BBC working base nearly 30 years ago when communism and the division of Europe seemed set in stone. And then, tendons permitting, it will be across the old iron curtain, where so much has changed.